A few years after the Boone family settled along the Femme Osage in Missouri, the War of 1812 broke out. Soon war parties of Native Americans loyal to the British began attacking American settlers up and down the Mississippi River. Though he wanted to serve, Daniel Boone was deemed too old to serve and stayed home to guard and protect the family. His son Nathan on the other hand, was ordered by William Clark to raise a company of Rangers, and he was soon leading them deep into the Illinois country above Peoria in his efforts to protect the frontier. Nathan continued his service in the back country until 1815 when the general alarm died down. Well known artisans and CLA members Jim Webb and Tim Sanner have created a commemorative pouch and horn set titled, “The Nathan Boone Pouch and Horn Set”. The beautifully carved powder horn for this set is based upon a horn that was said to have belonged to Daniel, and was until recently displayed in the bed room of Nathan and Olive’s Missouri home where he died. The where abouts of this important national treasure is currently unknown and only one image of it could be located. (National Geographic Magazine; Vol. 168, No.6; December 1985; page 837) Unfortunately that photo shows few of the actual details of the horn’s obviously elaborate carvings; carvings that were likely executed by Daniel himself. So Tim carved a version of the horn as it was imagined in a print drawn for the project by T.C. Albert. On one side, the horn is carved with the name and image of Daniel Boone astride a horse and appearing much as he was described when he rode into St. Louis on his way to Missouri. On the other is a fraktur style drawing of Daniel’s son and daughter-in-law, Nathan and Olive standing over traditional Pennsylvania Dutch flowers and turtle doves. Crafting a pouch to compliment such a horn could have presented a challenge if it were not for the artistry of Jim Webb. Combining applied and embroidered decorations including a federal eagle and shield on its flap Jim crafted a true work of art himself. Other decorations include a large applied white heart on the bag face, needle work cross hatching over the pouch body and flap, and an elaborately constructed and decorated adjustable strap. Taken individually, both the pouch and the horn are beautiful stand-alone pieces, but combined into a single one of a kind set celebrating one of our nation’s most well-loved heroes, his family and their exploits during our second war for independence, the “Nathan Boone Horn and Pouch” set is a contemporary national treasure. This horn and pouch, including a special set of the matted prints the horns carvings are based on will be just one of the offerings at this year’s CLA fundraising auction. We hope to see you there. Tim Sanner: “My interest in flintlock rifles began in the early 1992. When a good friend gave me a small cow horn and suggested that I needed to make myself a good priming horn, my journey into horn making began. For a couple years I made horns as gifts and gave most of them away. Over the next few years, I was blessed with the opportunity to study under two nationally known horners and expanded my skills as a craftsman. Born and raised in the Laurel Highlands of Somerset County Pennsylvania, where I live with my wonderful wife Diana and next door to my adult children, I make my powder horns in my small shop beside my home. I try to do research on each horn I make with a small collection of books that are loaded with pictures and descriptions of original horns from the 18th and 19th centuries. I make all my horns personally and try my best to keep them as historically accurate as possible. Of course, some of the makers creativity slips in once in a while! In keeping with the “old” ways of making horns, doing the largest majority of the work by hand I use files, rasps, and scrapers as much as possible. There are no epoxies used to install my end caps and they are all sealed with beeswax internally like the originals were. Jim Webb: “The first muzzle loading rifle I saw set me on a quest to learn everything I could about the old guns. My main focus over the years has been on the plain everyday guns made and used in the southern mountains. I live on a portion of the old family farm with my wife Susie, who is very creative, especially with needlework. We are most fortunate to have grown up and lived in southwest Virginia in the area known as the over mountain-backwater country. Many old timers here still possessed and used muzzle loading guns. There were also local gunsmiths who still made, repaired, rifled and rebuilt the old rifles as late as 1970 and they taught me how to make the rifles shoot well. I have spent many pleasant days hunting and shooting muzzle loading rifles. My collecting started with muzzle loading rifles and expanded to include everything related to them. Hunting pouches and accoutrements were plentiful and affordable and became my main interest. I then started making hunting pouches to use with my guns. Later my collecting expanded to include many things the everyday residents of the southern mountains owned and used such as; hand forged traps, knives, bag axes, fish and turtle gigs, tinder and tobacco boxes, Betty and grease lamps, mountain crossbows and whatever might show up that was affordable. 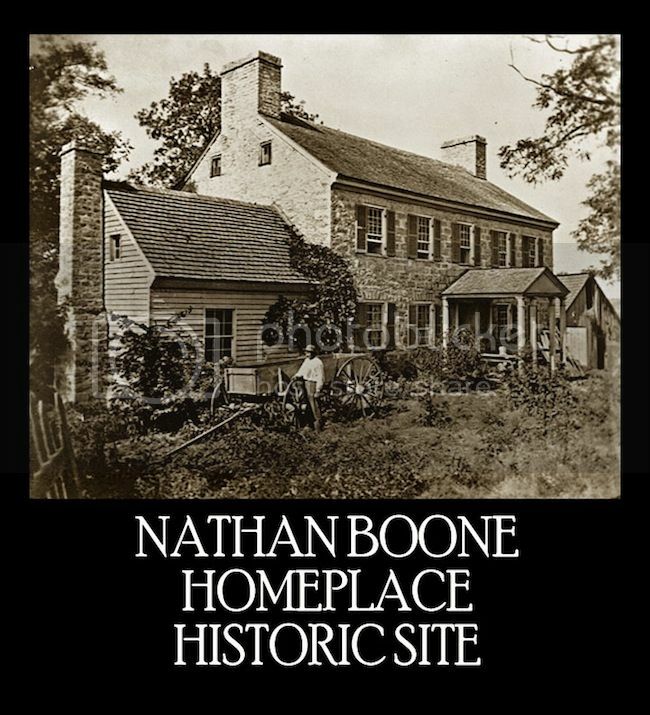 Nestled in the scenic Femme Osage Valley in southern St. Charles County Missouri sits the 3-1/2 story stone home that belonged to Nathan Boone; youngest son of Daniel and Rebecca Boone. Daniel had a cabin on this property and it was in Nathan’s home that he took his last breathe in September of 1820. Today the home is owned by Lindenwood University and is committed to maintaining the memory and legacy of the Boone family. Open year round; you’re invited to come visit and experience the changing seasons as Daniel did in the autumn of his life.